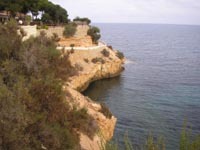 Information on the resort of Cabo Roig Spain, property, holidays, rentals. Cabo Roig: One of the most attractive and popular coastal resorts on the Costa Blanca, Spain, Cabo Roig is situated in the area known as the Orihuela Costa, the coastal area for the city of Orihuela (situated some 20 kilometres inland). Centering around its marina and 16th century watchtower (originally built to fend off pirate attacks, in more violent times, the older area of Cabo Roig is peppered with attractive detached villas, many owned by famous people. With its two lovely sandy beaches (Cala Capitan and Cala Caleta) and its fine marina, Cabo Roig is just what most people look for in the perfect holiday resort. The two Cabo Roig beaches both have chiringuitos (beach bars) which are open during the busy months, so you can get snacks and refreshments during the day. Parking at both can be tricky during July and August, so don't take too much beach stuff with you, unless you are going down early. You can also visit La Zenia beach, Playa Flamenca beach and Campoamor beach. Cala Capitan is probably best for young children, as it has two distinct areas, one of which is very shallow and safe. Lifeguards watch over both beaches, which also have "Blue Flag" status for cleanliness and safety. The well known Cabo Roig strip (of bars and restaurants), attracts visitors from both Cabo Roig and the surrounding Orihuela Costa resorts of La Zenia, Campoamor, Playa Flamenca and Villamartin. On the strip you will find all the choice of restaurants that you could need, with traditional Spanish restaurants sitting alongside, Chinese, Mexican, English, Irish, Italian, Indian, Australian and Thai restaurants. In the summer time there is plenty of live entertainment to be found, along with bingo, Karaoke, quizzes and other events. Of course the nightlife is better during the summer months, but bars like the Bushwacka continue with entertainment and events right through the year. Among the most popular pubs and bars on the strip, are the Bushwacka (Australian bar) with plenty of live groups, cheap drink and good value meals, the Queen Victoria (excellent breakfasts), Listers Bar, the Bog Road, the Trinity (good for Karaoke), and Bar Med (popular for watching the football). Among the most pleasant thing to do on a visit to the resort of Cabo Roig, is to take the coastal walk along to La Zenia (or even further if you have the time and energy), this attractive Cliffside walk, offers lovely views of the coastline, the Mediterranean Sea, and La Manga, and provides a pleasant way to spend a couple of hours, especially during the evening when the sun is not so hot. Start at Cabo Roig marina and follow the path round to La Zenia beach. Cabo Roig enjoys warm and sunny weather which is typical of the region, with some 300 sunny days each year and generally low rainfall, which mostly falls in the winter and early spring (be careful when visiting in March and April). If you are hiring a car and looking for some other places to visit whilst holidaying in Cabo Roig, you could try any of the following: Cartagena, for its harbour and Roman and Carthaginian ruins, Murcia, for its shopping and historic cathedral, Orihuela, for its many fine churches, Elche, for its palm forest and gardens, Alicante, for its shopping, port and the Santa Barbara Castle, Benidorm for its nightlife and its theme parks (Terra Mitica, Mundomar and Aqualandia), the Rio Safari Elche (safari park), and the Mar Menor for its fine beach resorts, warm, safe waters, and its water sports. Closer to hand are the Go-Karts at Punta Prima (also paintballing and kiddies fun fair), and the town of Torrevieja, with good shopping, fine marina, beautiful promenade, fun fair, cinema and tenpin bowling alley. While there is not a proper hotel in the resort (the nearest is the La Zenia Hotel), there are a couple of aparthotels, for instance the Diamont Blue (book using the quote box on the right). However most visitors choose to rent self-catering villas and apartments, of which there are a great choice. A great location for golfing enthusiats, the resort is ideally situated close to the three courses of the Orihuela Costa, the best known of these being Villamartin (which once held the Mediterranean Open), Villamartin golf course is around 10 minutes drive from Cabo Roig, while the other 2 courses Club de Golf Campoamor and Las Ramblas are even closer. Other nearby golf courses include Lo Romero between Pinar de Campoverde and Pilar de la Horadada, La Marquesa at Rojales and a choice of courses along the Mar Menor (Roda Golf, La Serena and the Mar Menor Golf Resort). Easily reach Cabo Roig from the AP-7 motorway (La Zenia or Dehesa de Campoamor exits) and the N-332 coast road. It is about 7 kilometres south of Torrevieja. Driving times from the nearest airports are 25 minutes from Murcia (San Javier) airport, and 45 minutes from Alicante airport. From San Javier airport it is easiest to take the AP-7 motorway (head for Alicante), from Alicante airport you can take the N-332, or the A-7 motorway (changing to the AP-7 motorway). Airport driving distances: Murcia (San Javier) airport to Cabo Roig is a driving distance of 25 kilometres (15 miles), Alicante airport to Cabo Roig is a driving distance of 86 kilometres (53 miles). You can use either the motorway or the N-332 from either airport, from San Javier follow signs for Alicante and from Alicante airport follow signs for Cartagena.